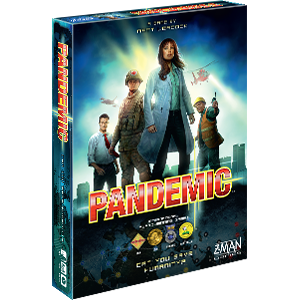 Order Pandemic: Fall of Rome at your local retailer or online through our website today! The ground shakes as the barbarians continue their steady march across the countryside toward Rome. Rushing to defend the cities from invasion, the Roman legion gathers. Commanders call out orders and the soldiers surge forward to face the onslaught of invaders. The clash of swords rings out as the battle begins. 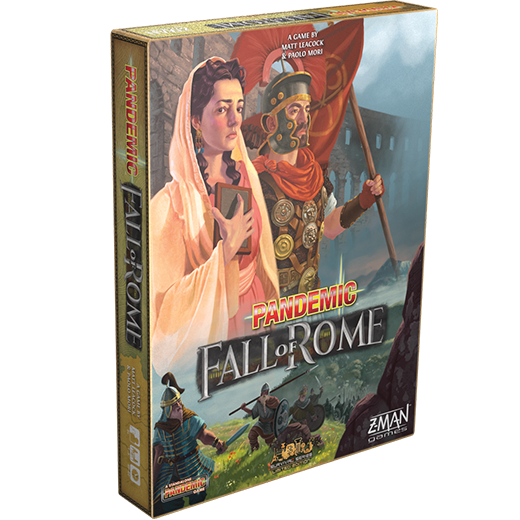 Unite with your fellow Roman citizens, utilizing soldiers and allies to stop the onslaught of barbarians. Can you keep Rome from falling? Pre-order your copy of Pandemic: Fall of Rome today from our webstore or your local retailer! Rome wasn’t built in a day. It took a great team to put the Eternal City together and it will take a great team to keep it from falling. Each player will take on a role with special abilities to improve the team’s chances at success. 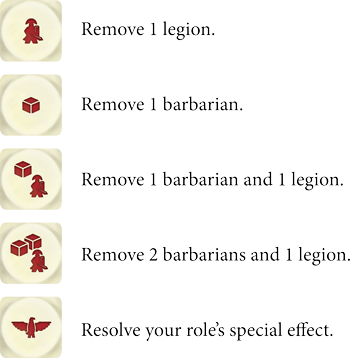 Some roles will help with quick movement, others will help fight against the onslaught of barbarians. The Consul is a chief magistrate and controls the movements of the Roman legion, allowing additional legions to be placed in cities. The Magister Militum commands the military, bolstering the legion in battle and protecting them. 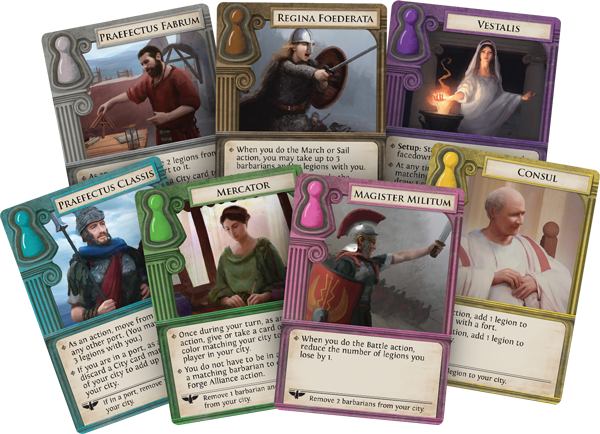 The Mercator uses their trading and negotiation skills to give or take city cards or to forge alliances with barbarians in another city. The Praefectus Classis commands the fleet, quickly moving the strength of the legion from port to port. The Praefectus Fabrum is a well-trained engineer, constructing forts to help protect against future invasions. The Regina Foederata utilizes her connections, bringing barbarians and/or legions with her as she travels or enlisting the barbarians to help without spending a card. The Vestalis communes with the goddess for more information, drawing from an event deck and drawing additional player cards. Utilizing each character’s special abilities and working together will help pave a path to victory to save the city. If instead the eagle symbol is rolled, that activates the special ability on your role card. Sophie is playing as the Consul. If she rolls the dice to reveal the side with the eagle that will activate the special ability on her role card. She rolls a total of one legion icon, two barbarian icons, and the eagle icon. Two barbarian cubes are removed from the city. 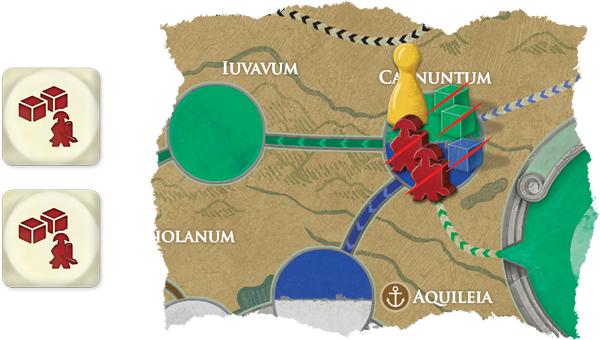 The eagle ability for the Consul adds one legion to the city and the dice result rolled takes one away, leaving two legions and one barbarian cube still in the city. Prepare for the oncoming barbarians, this limited-edition game is available for pre-order now!